Like all good cult movies (and DONNIE DARKO is a very, very good cult movie), Richard Kelly's mind-bending feature struck out in its initial theatrical release. I don't believe it even played Cleveland auditoriums at the time except for two days at the Cinematheque in University Circle in 2001. Ouch! 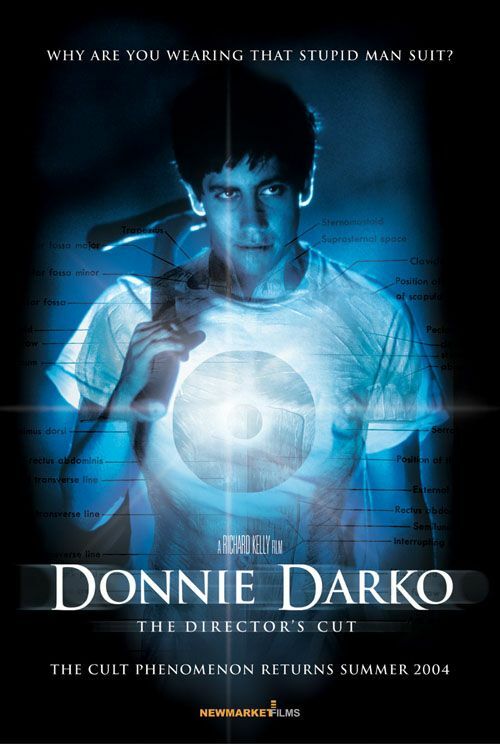 But, in a rather remarkable development, a groundswell of support from critics and DONNIE DARKO fans compelled distribs to actually give the property a second chance and re-release DONNIE DARKO later in the decade with a higher-profile ad campaign. I don't think it hit big then either, but the point is...this you've gotta see. The setting is a cozy, affluent suburb in October, 1988, Donnie Darko (Jake Gyllenhaal), a rebellious teenager, smart but diagnosed with mental illness and sort of a misfit at school, is lured from his bedroom by a phantom wearing a grotesque, metal-masked rabbit costume. The rabbit, `Frank,' tells him exactly when the world will end - in 28 days, on Halloween night. Meanwhile a shattering series of events disrupt Donnie's already-unsteady world. A plane engine falls out of nowhere onto his house. A sympathetic English teacher (Drew Barrymore) is punished for assigning her class the "dirty" author Graham Greene. A youth-mentoring positive-thinking guru (Patrick Swayze) brainwashes the community. There's young love for Donnie, and, let's not forget, visions of wormlike appendages emerging from peoples' chests. And the neighborhood crazy lady turns out to be an ex-nun scientist who researched time-travel and metaphysical cause-effect paradoxes. Got all that? Great dialogue between Donnie and Frank: Q - "Why are you wearing that silly rabbit suit?" A - "Why are you wearing that silly man suit?" More menacing visits from the rabbit lead to a Halloween night revelation, and Donnie realizing his pivotal role in this weird, interconnected web of destiny. DONNIE DARKO works well on numerous levels - as a brainy piece of science-fiction, an ominous psychological thriller, a satire on suburban values, or a tragic drama of a doomed teen rebel. Or all of the above, and a trick on the audience, since we are basically seeing everything from Donnie's POV, and at the outset we hear he's not very reliable about taking his meds. Gyllenhaal is great as a guy who can be likable, sympathetic and psycho-scary all at once. Though Donnie - sometimes in a trance-state, sometimes consciously - commits vandalism and lashes out, he's smart enough to sense the eerie time-warp pattern behind all the odd goings-on. And he's heroic enough to make a Christ-like sacrifice at the end, for the good of everyone else, when the `end of the world' comes. Though it's possible he never had a free-will choice - discuss amongst yourselves.